For other people named Thomas Frank, see Thomas Frank (disambiguation). Thomas Carr Frank (born March 21, 1965) is an American political analyst, historian, and journalist. He co-founded and edited The Baffler magazine. Frank has written several books with great impact, most notably What's the Matter with Kansas? (2004) and Listen, Liberal (2016). From 2008 to 2010 he wrote "The Tilting Yard", a column in The Wall Street Journal. A historian of culture and ideas, Frank analyzes trends in American electoral politics and propaganda, advertising, popular culture, mainstream journalism, and economics. His topics include the rhetoric and impact of culture wars in American political life and the relationship between politics and culture in the United States. Frank was born in Kansas City, Missouri and grew up in Mission Hills, Kansas. He graduated from Shawnee Mission East High School, and in 1988 from the University of Virginia with a Bachelor of Arts degree in history after transferring from the University of Kansas in his freshman year. Frank received a Master of Arts degree in history in 1990 and a doctorate in history in 1994 from the University of Chicago. Frank was originally a College Republican, but he has come to be highly critical of conservatism, especially the presidency of George W. Bush. Frank summarized the thesis of his book The Wrecking Crew: How Conservatives Rule as "[b]ad government is the natural product of rule by those who believe government is bad." Frank's other writings include essays for Harper's Magazine, Le Monde diplomatique, Bookforum, and the Financial Times. His book What's the Matter with Kansas?, published in 2004, earned him nationwide and international recognition. Since December 2010, Frank has written the monthly "Easy Chair" column for Harper's Magazine, alternating bi-monthly with writer and journalist Rebecca Solnit. Frank has called President Donald Trump "the worst politician ever" and stated that Trump could win the 2020 presidential election. He also believes that "quasi-fascist movements" are springing up around the world. Frank lives in Bethesda, Maryland, with his wife and children. Frank, Thomas (1997). The Conquest of Cool: Business Culture, Counterculture, and the Rise of Hip Consumerism. University of Chicago Press. Frank, Thomas (November 2012). "All the rage". Easy Chair. Harper's. 325 (1950): 6, 8–9. The Trap (TV Documentary Series): Frank features in the BBC documentary. What's the Matter with Kansas?, a 2009 documentary film produced by Joe Winston and Laura Cohen. The film was inspired by Frank's book of the same name; Frank appears in the film and receives a writing credit. "American Feud: A History of Conservatives and Liberals" includes interviews with Frank speaking about the division between "red states" and "blue states" and other aspects of American politics. ^ "Bill Moyers interviews Thomas Frank". pbs.org. PBS. August 1, 2008. Retrieved August 3, 2016. Wikimedia Commons has media related to Thomas Frank. Class is Dismissed Thomas Frank's reply to Bartels' study, "What's The Matter With What's The Matter With Kansas". VIDEO: Thomas Frank, Aug. 14, 2008, The Wrecking Crew: How Conservatives Rule, presentation at Powell's Books in Portland, Oregon, from recent book tour. VIDEO: Thomas Frank discusses Pity the Billionaire on January 5, 2012, on WGBH's Forum Network. 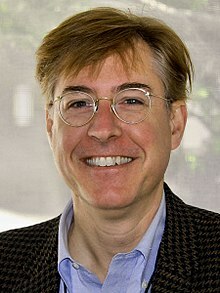 Thomas Frank interview on February 13, 2012, on the History News Network.